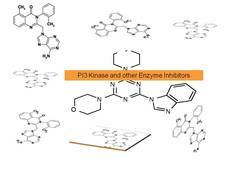 Published by Luxi Zhang and co-workers in a 2013 paper (J.Proteome Research), their key reagent for stripping cell lysates by one-step affinity adsorption of kinases has been made available on a commercial basis as KiNet-1 (R). Here the active agent is immobilized to Sepharose beads and serves as a broad-band capture tool for kinases. 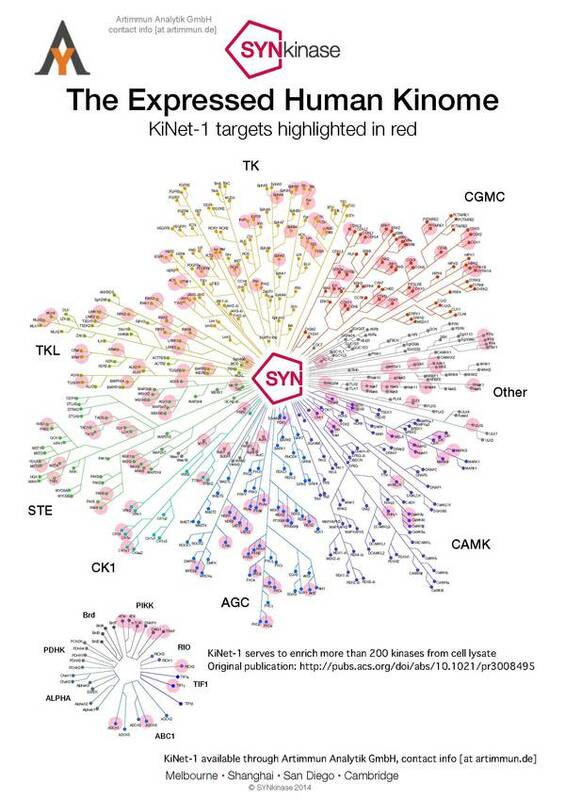 The affinity tool may enrich more than 200 kinases in your cell lysates, depending on the cell line used. While the orginal method has been applied for analysis by mass spectrometry, analysis of abundant proteins by ELISA or Western blot is possible as well. Customers in Europe may access KinEt-1 (R) through Artimmun Analytik GmbH, info [at artimmun.de]. Sets are available in pack sizes for 10-20-50 runs and include a detailed protocol. 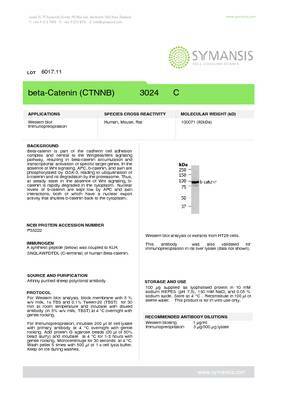 1) CTx0294885-Broad Spectrum Inhibitor as Affinity Reagent. ß-Catenin forms part of the cadherin / adhesion complex and presents a focal point in wnt signaling. 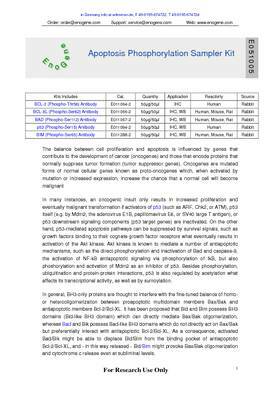 It has been suggested that ß-catenin may also get involved with activation of the erk signaling pathway, supporting carcinogenesis. Dephospho ß-Catenin represents the active signaling part of the protein while post-translational accumulation has been placed under negative control through phosphorylation. This drives the protein towards ubiquitination and degradation. Most of our signal transduction antibodies have been raised in, at least, two host animals and have been rigorously tested in Western Blot and Immunhistochemistry. A few are also suitable for immunoprecipitation. Symansis ß catenin antibody from sheep shows a huge dynamic range in Western Blot. This has been exploited in a signaling array plate which offers flexible combination with antibodies for creb, GSK 3 alpha and beta or other parameters of interest: the Multi Kinase ELISA Array. Assemble your array by selecting enough 2x8 well strips to set up a 96 well microtiter plate (see the menu on the picture below). Choose from 9 pre-assembled sets or focus on PI3 Kinase downstream signalling. 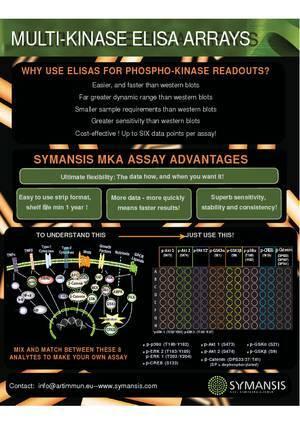 A 2 hrs protocol yields semiquantitative data about selected phosphosignaling pathways in your cell lysate. Very economical, yet more sensitive and with a higher dynamic range than standard Western Blot read-outs, this colorimetric assay offers unique combinatorial set-ups, especially upon tandem use with Symansis inhibitors or Inhibitor Arrays. 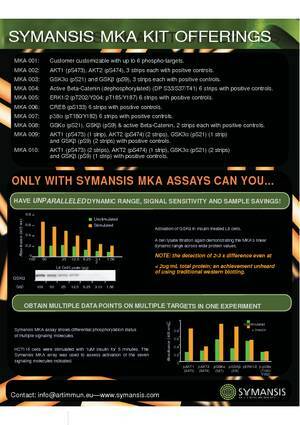 WIth its current focus on MAP Kinase, use Symansis inhibitor array to save time and costs. Optimize inhibitor use by maintaining a concentration window close to the EC50 of your target cell. 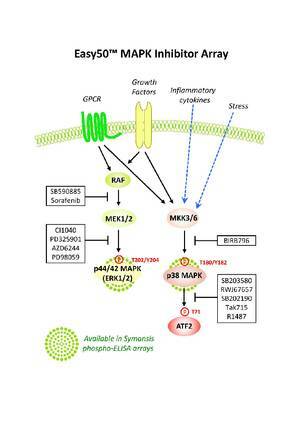 A click on this link will produce an overview of Symansis Kinase Inhibitors available by us. 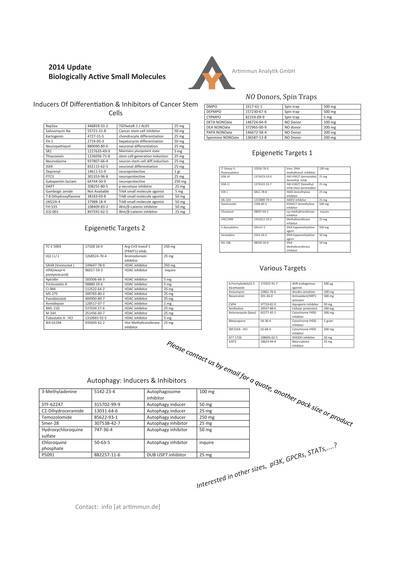 You may also send a mail to info [at] artimmun.de for a comprehensive list covering other target proteins as well. Choose from 300 + highly purified inhibitors, many addressed with their biological targets in a recent publication!